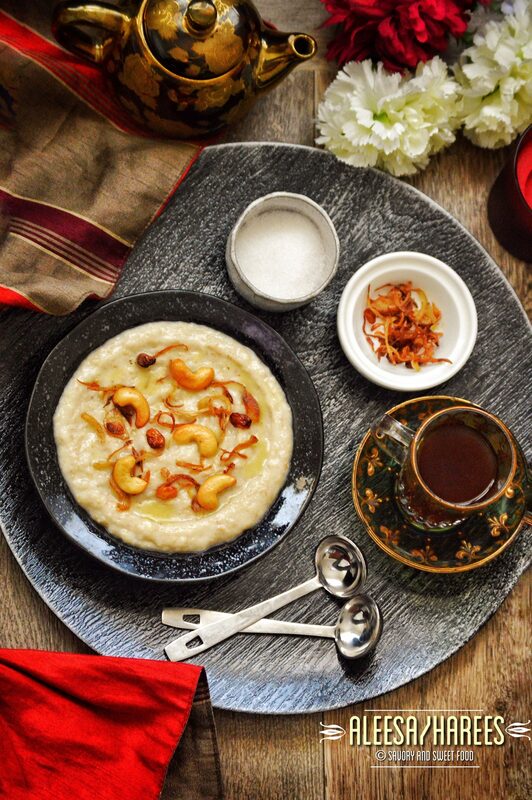 Aleesa or Harees is a one pot wheat porridge made with chicken/ lamb and few spices. It originated in the Middle East but is also a popular dish among the Mappila of Kerala. This recipe which I posted here is the Mappila version. This particular recipe has been requested so many times by so many of you guys, and here I am, finally posting the recipe for it. 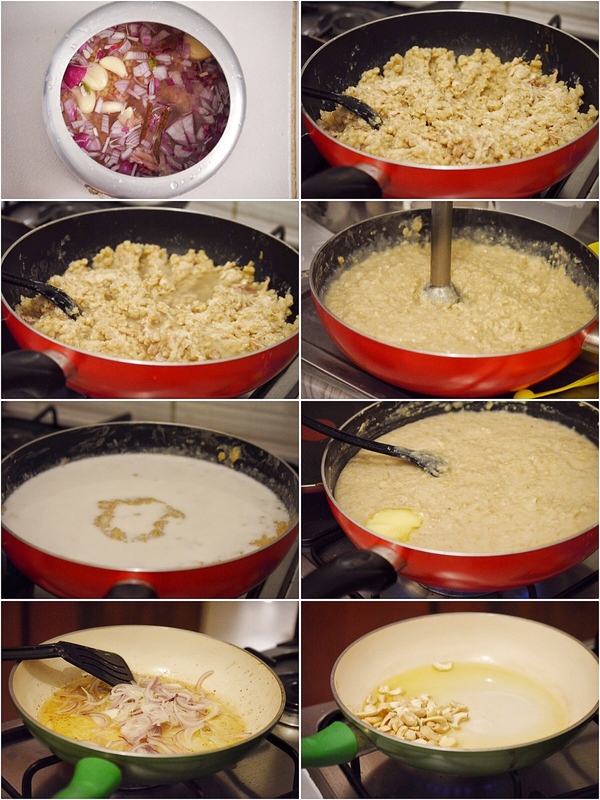 I think most of you had asked for this recipe during last Ramadan, so sorry for posting this so late. This dish is very popular in north Kerala (India) too. There are slight variations in the method of preparation but the base is same. In Kerala it is called Aleesa/Alisa. This dish is very popular during Muslim weddings. It is served as a starter just before the main course which would be mostly Biryani as the main dish and other huge list of items. 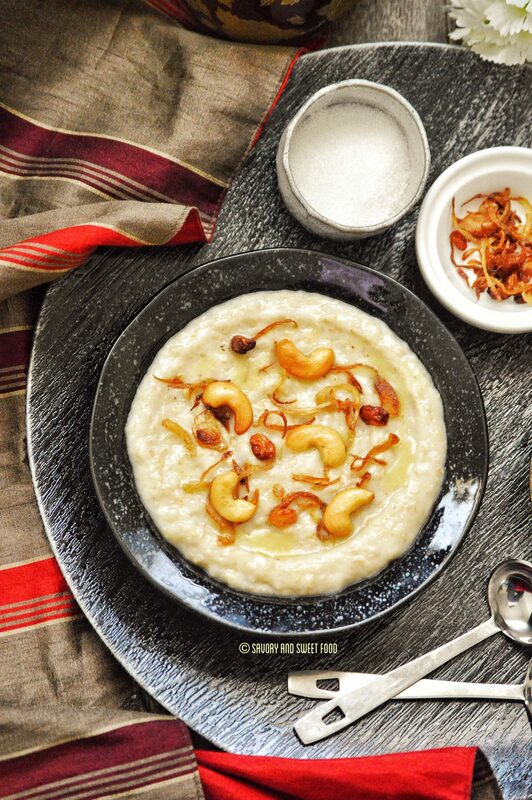 Aleesa is served with fried onions, cashews and raisins on top and finally a spoon of ghee is drizzled all over it. Most of them like eating this dish with a sprinkle of sugar over it. I know it sounds weird…sugar over a dish which has chicken in it…but it is a superb combination. Now, I have one confession to make, I had never ever tasted Aleesa before in my life 🙂 . I had experienced the Aleesa taste for the first time with this preparation of mine. And I was pretty impressed with it. I always used to feel very yucky when I see the texture of this dish. I never used to like any sort of porridge much, like say..oats. But now I have started having all of it and I am thinking…why did I make such a fuss by not eating all these before. My mom had a tough time with me as I was a picky eater, hehe! Ok back to this recipe, it is very easy to prepare this if you have the wonder vessel, the pressure cooker. Otherwise cooking time will be a little long. The main thing you have to keep in mind is the type of wheat you use for this dish. Over here the name of the wheat used is harees wheat. It is skinless (the bran has been cleaned off). It is not broken wheat, pearl barley or boiled wheat either. I know, it sounds complicated…I was confused too in the beginning. You can add more or less chicken as you like. If you feel your Aleesa is too thick with the proportion I gave, add extra milk (cows milk). It tends to thicken as it sits. What I did the next day was while heating, I added milk to make it a little loose. You can substitute coconut milk with cows milk. 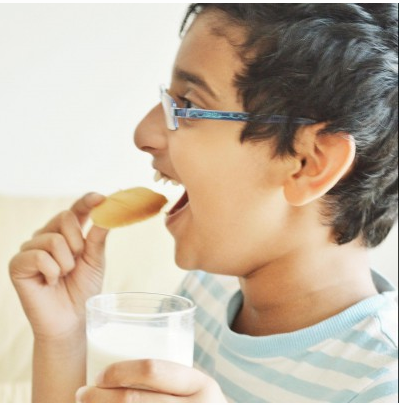 But coconut milk gives an authentic malabar flavor to the Aleesa. Do not omit the cashew, onion and raisin part. It is key to this dish. Soak the wheat in water overnight or for a minimum of 5 hours. Add wheat, chicken, onion, spices, garlic, salt and 1 liter water into a pressure cooker. Set the flame to high and close the pressure cooker lid. Let the whistle blow once. IMMEDIATELY REDUCE HEAT TO LOW and pressure cook for 1 1/2 hours or till the wheat will gets completely cooked. The wheat should be puffed up and very soft to touch. Take out the chicken bones and the whole garam masala. Add 1/2 cup water if the wheat is very thick (mine was). Blend well with a hand blender while still hot until all the cooked wheat is ground. Remember that you shouldn’t make the mix like a puree or paste. Transfer this to a big pan in which you can stir around well. Turn on heat. Pour the coconut milk and stir till well incorporated. Add in the ghee and salt, if required, stirring continuously. At this stage, if you feel that the aleesa is too thick add little milk. In a frying pan heat ghee add fry the cashew and raisins. Keep aside. In the same ghee fry onions till golden brown. Reserve the left over ghee. Take 1-2 ladleful of Aleesa and put it in a plate. Add raisins, onions and cashew nuts. 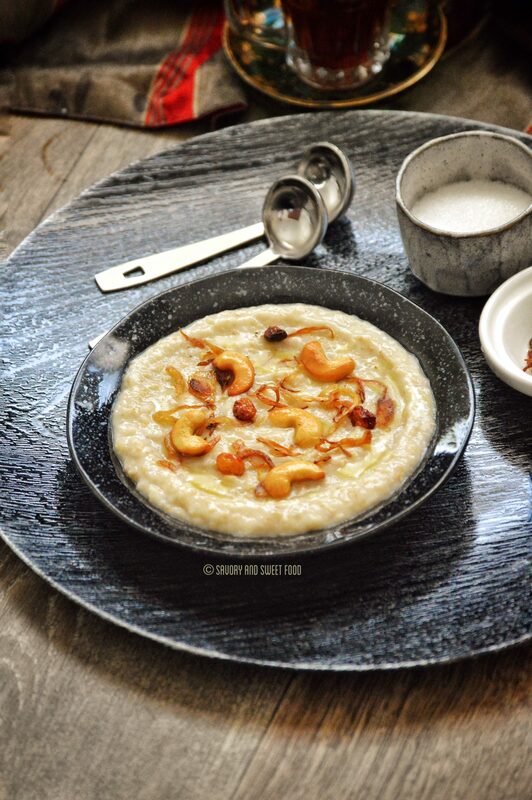 Drizzle the reserved ghee on top the aleesa and serve with a generous sprinkle of sugar. Serve warm. 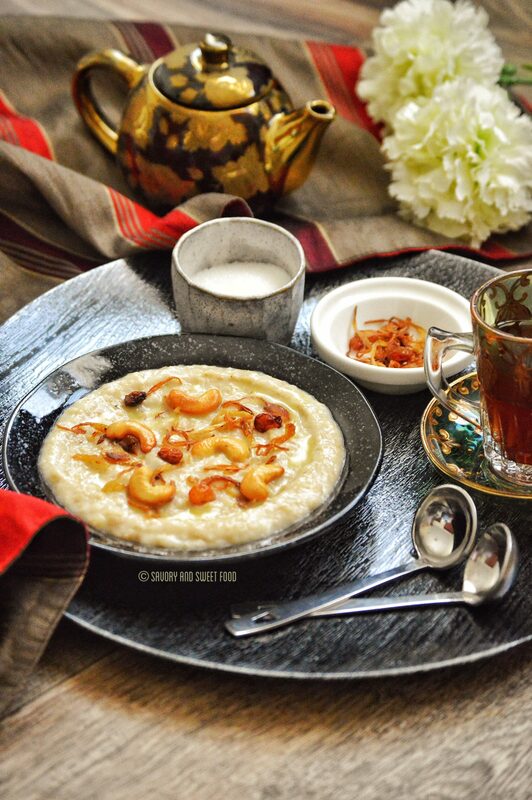 Aleesa or Harees is a one pot wheat porridge made with chicken/ lamb and few spices. It originated in the Middle east but it is also a popular dish among the Mappila of Kerala. This recipe which I posted here is the mappila version. Soak the wheat in water overnight or a minimum of 5 hours. Add in the ghee and salt if required stirring continuously. At this stage, if you feel that the aleesa is too thick add little milk. In the same ghee fry onions till golden brown. reserve the left over ghee. It tends to thicken as it sits. What i did the next day was while heating I added milk to make it little loose. MashaAllah the pictures are tooo tooo good Sadia! !That’s looks so lovely! 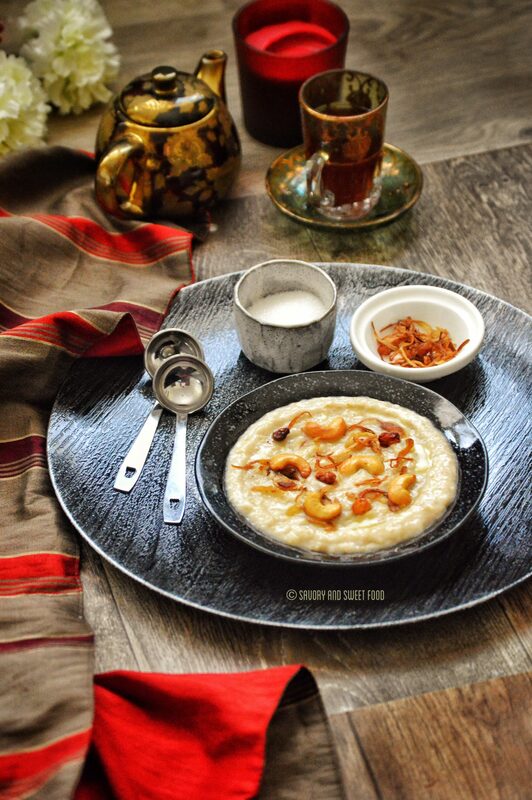 Loved the presentation as always….but I have a suggestion here, u don’t need to add extra water or milk if u cook the wheat in this proportion ; 1 cup wheat :3 cups water….it will b perfect!! I too became an aleesa/harees/ Haleem fan recently!! We usually don’t add garlic to it…other than that,ur recipe is exactly how I too prepare Alsa. Thank you for the suggestion and tips Buraida. I will try alsa with chicken kakkam soon. It sounds yumm. As always amazing pictures.. design and content. Keep it going. This is something that we devour during Ramadan, the packets and packets we used to receive from uppa’s friends. 🙂 I never knew that it was a Thalassery delight till I got married. 😀 What I find in variation, and already posted both the versions on the blog – the Mappila version is with coconut milk and mostly chicken, but the Emirati version is always with water and mutton. Both of the recipe have its own charm… and yes, like Buraida mentioned, the combination with this with chicken curry is just awesome… Sometimes I just mix them up together and make it as a meal… I am considering taking a ticket and coming to Kuwait to raid your props… all of them are simply amazing! Yes I remember seeing a harees post in your blog. Didn’t know the difference between Emirati and our aleesa. Thanks for the info. Aleesa with curry is next on my list to try. I’m sure that it will be a great combination. Sure, come to Kuwait. Btw I left the props you gifted me in Dubai. I forgot to take it. I had kept it safely in a drawer .